Janet Brannon has coached, officiated, and/or played in the Oklahoma metro area for the past 25 years. She has coached her 11UA team in back to back OKRVA championships 2017 and 2018. Last year her 11-UA team won the OKRVA Regional Tournament, had a player named Regional Tournament MVP and qualified for USAV Junior Nationals in Detroit. They opted to attend AAU Nationals in Orlando, FL and finished tied for 21st. This year she will return as the Head Coach with the 11-Under Armour team and add in Assistant Coach for the 18-UA team. Janet is also the Director of Coaching for the South teams and is a certified Bring Your Own Parent instructor which is a youth volleyball program for ages 5-10yrs old. She started playing volleyball in the Edmond school system at the age of eleven. She has been a member of USA Volleyball since 1991 playing women’s club volleyball. She is IMPACT and CAP I certified with USA volleyball as well as a certified referee and scorekeeper. She has coached youth club volleyball since 2004. In February 2008, she began a youth league in Moore, OK. Shortly thereafter in April 2008 she was hired as the head volleyball coach at Southmoore High School and responsible for the junior high volleyball program as well. In her first year at Southmoore, the program’s record was 2-22. Each year the program records have improved. In 2013, she led Southmoore varsity to win their first OSSAA Regional tournament thus being the first Moore district school to ever advance to OSSAA State Tournament. She was selected OCA Region 5 Coach of the Year in 2010 and 2014. She was selected as the 2014 OCA Large West All State coach and led the team to defeat Large East in a dominating victory 3-0. In 2008 she founded OESA starting with one team. She was the executive director of OESA from 2008-2015. 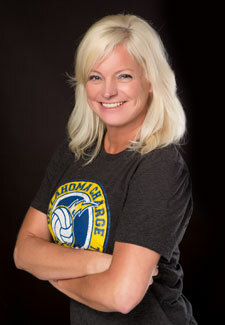 In the 2012 club volleyball season, she was the Head coach of Oklahoma Edge 12-1 team that won the Oklahoma Regional Volleyball tournament and the bid to attend the USA Girl’s National Championship tournament in Atlanta, GA. She has coached teams in the 2013 and 2014 AAU National Tournaments. She is married to Jay Brannon and the mother of their eight children, all of which are or have been athletes within the Moore Public School system. She has had six of her children earn collegiate athletic scholarships. Her oldest son played football for OBU, her second oldest son played men’s volleyball at King University and Lindenwood University, her fourth son played baseball at Seward County Junior College, her oldest daughter played women’s volleyball four years at King University and is currently a GA for Lenoir-Rhyne University, her second daughter plays women’s volleyball at Tarleton State University, her youngest son plays at Erskine College, and her youngest daughter has committed to play women’s volleyball at Lees McRae College.